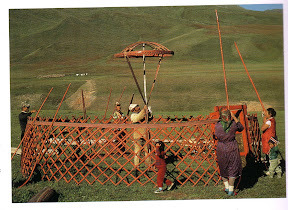 From the Caspian Sea to Mongolia, Turkomen, Kazakhs, Uzbeks, Kyrgyz, and Mongolians live in tent dwellings – with single-room circular plan, lattice frame of willow wands that expand to form the wall but which retract to a compact shape, and light poles arc to form the roof structure joining a ring at the crown. Once the structure is up, the structure is covered with woollen felt mats. 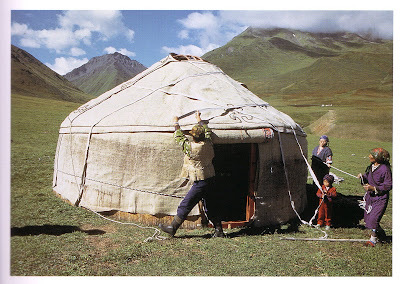 The Kyrgyz yurta has the entrance facing south. Inside, one is supposed to move in a clockwise direction . The interior is divided into four sections: one enters at the entrance in the southern quadrant; move left though the male domain with saddles, weapons and hunting gear; then through the north quadrant, where the altar sits facing the entrance and where important guests are received. The quadrant comes next is where women and children sleep. At the centre, directly below the ring crown/smoke hole, is the hearth. 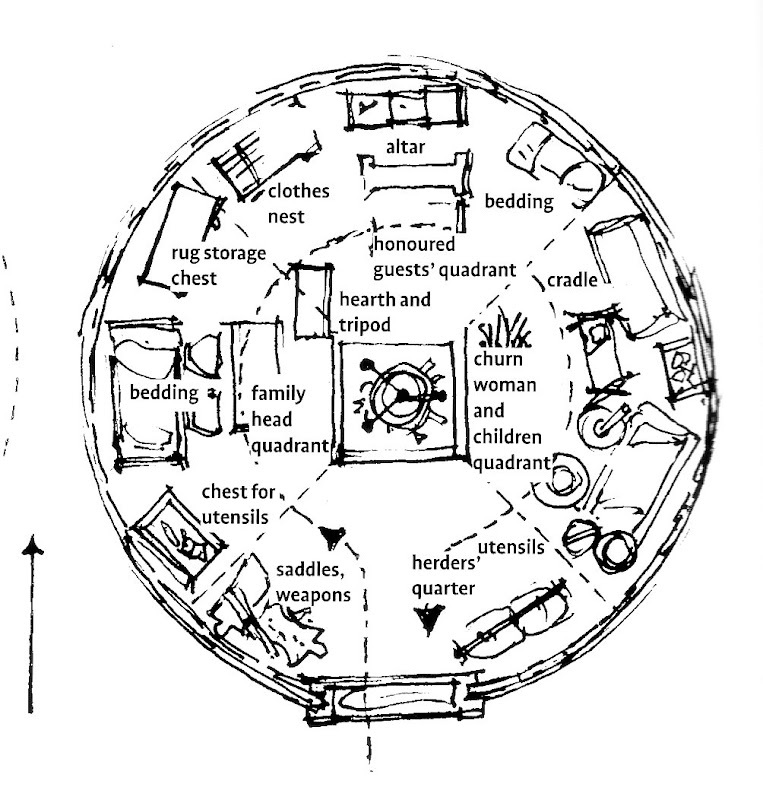 The spatial organization in the yurta is not only functional but has assumed the trappings of a tradition. 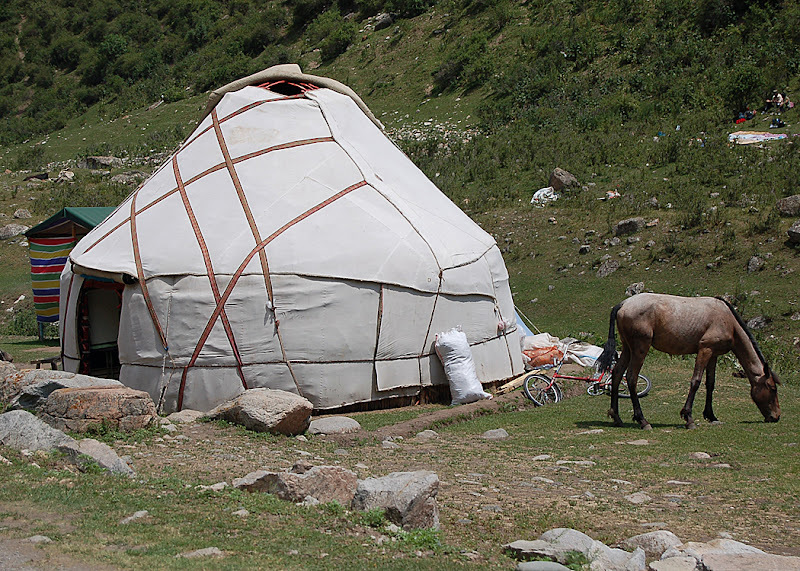 Nowadays, most Kyrgyz live in apartments, but they still put up the yurta to celebrate the birthdays of their sons or parents , and invite guests to the dastarkhan, or table for feasting. 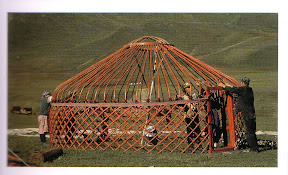 The Yurta is also the place where the Kyrgyzes gather for the funeral of their relatives. Sorry that I have not commented as much, I have been reading but just being lazy! PS: Svet is reading your book and she is so happy, She said last night that she can understand your book and she finds it very interesting! Svet said to be looking in the mail before long. She has a package coming to you. Just be patient. The mail system here runs very slow this time of the year. Holiday are for all in Russia! "a round tent, In a round yard, With a round House, In a round city, In a round country, In a round world"
That is something I'm seriously thinking about! Happy New Year to you and Svet too! Hello, I now became a member of this forum here and I would like to be a part of it. Just enjoy the environment here. Good work by the admin and each member here. [url=http://www.home-businessreviews.com]home business reviews[/url] that reviews some cool home business reviews. Anyway site owner earn's more than 500$+/day. He found some very cool home business ideas. Because I found that these home based business worked for me I decided to post it here so you also can make some extra money in your free time. Owner of this site also discovered very simple way get some extra cash just taking [url=http://www.home-businessreviews.com/Surveys-For-Money.html]surveys for money[/url]. Anyway if you need to earn some extra cash feel free to check out this website. Hope you guys enjoy it.